The consumption of protein supplements is nothing new. For decades, individuals in the fields of fitness and health have espoused the idea that dietary supplements of protein can produce fantastic benefits for your health. Whether those protein supplements come from protein bars or protein powders, supplementation of this nutrient has been brought back into focus. Because of the intensified focus on protein supplements, and more specifically, protein powders, the market is flooded with a broad selection of protein powders; consequently, choosing the right protein powder has become something of a challenge. We are here to help you to sort through it all in order to come up with the right protein powder supplement to fit your needs. How can we help you narrow down your choice? Our buying guide will provide you with some information about protein powders in general and our review of ten top protein powders will provide you with a means of comparing the various products available. We hope that once you have become well educated about protein powders that you will be able to make a qualified choice concerning the one which is best suited for you. Let’s go ahead and get started by examining some general characteristics of protein powders in our buying guide. What are the benefits of protein powders? Protein is an important nutrient for a variety of reasons. It helps the body repair and build tissue, it is significant in the production of enzymes and hormones, and an essential element in the construction of muscle, bones, cartilage, skin and blood. Obviously, the supplementation of additional protein has a greater effect on these processes. Many people cannot consume sufficient amounts of foods that are rich in protein in order to reach the level of protein they desire, so they make use of protein powders in order to increase the concentration of protein in their system. The benefits you expect to get from protein powders are related to whether your objective is building muscle or weight loss. Let’s look at how protein powder works for each of these objectives. Protein powder has been a favorite for body builders and athletes for decades. Their use of these supplements is related to building muscle, which enhances athletic performance or increases muscle bulk. Protein supplements are typically consumed by those building muscle right after a workout in order to absorb its benefits as quickly as possible. Some protein powders, though they are not as numerous, are designed to help with weight loss rather than building muscle. Supplementing protein in your diet increases your body’s metabolic rate, which in turn helps to burn calories more rapidly, resulting in weight loss. Regardless of your objective, it is essential to develop a better understanding of the various types of protein powders and what effect they can have. Not all protein powders are created equal. In fact, protein powders get their protein from various sources. Which source of protein works best for you will depend upon your objective as well as some personal preferences. Let’s take a closer look at the various sources of protein. The most common protein powders on the market are whey based proteins. They are the cheapest to get a hold of because they are a byproduct of cheese processing. There a two types of whey proteins available and they have varying effects on those who consume them. This is the most popular source of protein in protein powders because it is high in protein, but has a low ft concentration. Besides being the cheaper of the two whey sources, it also has more carbohydrates to give you an energy boost. This protein source requires a bit more processing. They isolate proteins by removing fat and lactose from the whey resulting in a more pure protein. This addition processing tends to make them more expensive, but they are helpful to those who desire to limit carbohydrate intake. The beginning process of making cheese is the coagulation of caseins found in milk. These clots or gels of casein molecules are used to make a separate type of protein powder which takes a lot longer to digest than the faster acting whey protein types. When you are awake, you are able to consume protein and get its full benefits, but some people want to continue the metabolic and tissue building process while they are asleep or at rest; that is where casein protein comes in. Casein protein is digested very slowly over a longer period of time. You can keep a consistent amount of protein flowing through your body even while you are asleep. What happens if you are lactose intolerant? After all, both casein protein and whey protein come from a milk product. That is where plant based proteins come into play. In addition, there are those who follow a vegan lifestyle who are also seeking protein supplementation. In some cases, because vegans do not eat meat or other animal based proteins, they lack sufficient protein in their diets, for them protein powders are a means of obtaining this vital nutrient. Though they tend to work a bit more slowly, plant based protein powders are still a great source of protein supplementation over whey proteins, which tend to prevent a rise in insulin levels and can activate some cancer-signaling pathways. Plant based protein powders generally don’t taste as good as whey and casein powders, and they don’t tend to react well when added to liquids, so they are sometimes a bit difficult to swallow; literally. This is one of the most common plant based proteins used in protein powder as well as other “healthy” foods. Soy is not recommended for men because it has an estrogen-like effect. It can reduce sperm production, contribute to erectile dysfunction, and has been linked to some behavioral issues in men as well. The protein derived from peas and legumes contains higher chain amino acids which are a more concentrated source of protein than most plant based proteins and are isolated from the fiber of peas. This plant based protein is higher in the amino acid, methionine, but lacks important amino acids like threonine, leucine, and histidine. This protein powder tends to be grainy and doesn’t mix well and you run the risk of heavy metal contamination which is common in rice. The amino acids of hemp are complete amino acids that are isolated without the psychoactive effects of cannabis. Hemp also contains plant-sourced omega-3 fatty acid, alpha-linolenic acid and gamma-linolenic acid. The smell and aftertaste of hemp protein is a major drawback. Is probably one of the best options for a plant based protein powder as it tastes good, mixes well in liquid, and is rich in minerals. It does not have a peculiar smell and aftertaste like hemp and other plant based protein powders. What nutrients are typically found in protein powders? Besides protein, there are other nutrients found in protein powders. Depending on your objective, varying amounts of these nutrients can have an impact on the end result produced by the protein powder you use. It is important to read labels and understand what else is in your protein powder besides protein. Carbohydrates are important for energy and are essential among those who are using protein powders for athletic performance because they burn up rather quickly. For someone focused on weight loss carbohydrates tend to work against your objective if you are not active enough to burn them up. We have already discussed the types of proteins in detail, so reading labels will help you to determine the type of protein in the protein powder you are considering. In addition, you will want to take a closer look at what percentage of the powder is actually protein. There is really no point on filling up with something that isn’t really helping you reach your goal. Fiber comes in two forms: soluble and insoluble. Soluble fiber is easily absorbed into the blood stream and helps regulate blood sugar and cholesterol. Insoluble fiber passed through your digestive system more quickly and helps to prevent constipation and other dietary issues. Be sure that a good amount of fiber is on the list of nutrients in your protein powder. It is almost impossible to get away from fat completely when using protein powders. You are going to get some fat along with your protein in whatever form you consume it. Try to choose protein powders with a fat content at an absolute minimum. 5 grams of fat or less is an optimal level in the best protein powders. Though not all protein powders include these additional nutrients, you certainly shouldn’t put one that contains them back on the shelf because there are too many additional nutrients like these added into the formula. With some knowledge about protein powders in general, use the information as a means of comparing the ten protein powders in our review below in order to narrow down your search for the protein powder that best fits your objective as well as your lifestyle and personal preferences. 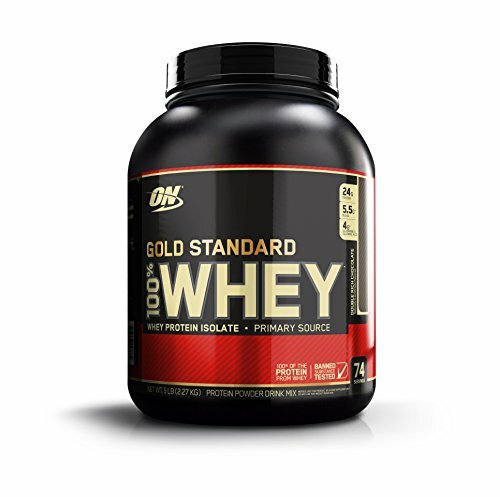 You will get great bang for your buck using Optimum Nutrition Gold Standard 100% Whey Protein Powder. 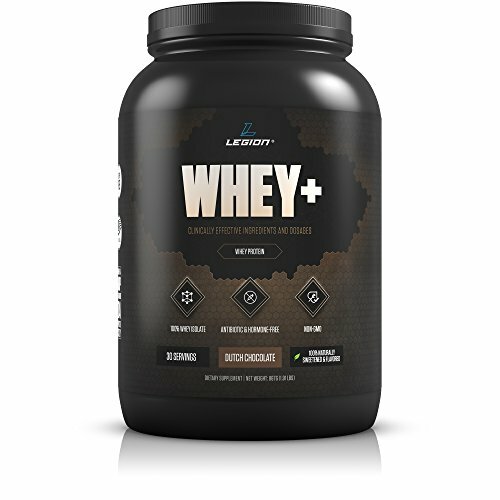 This powder combines whey concentrate and whey isolate to give you a great blend of the two best sources of protein for building muscle and athletic performance. It mixes well and has a wide variety of 21 flavors to choose from. The nutritional makeup of this protein powder provides a good balance of 24 grams of protein while only including 3 grams of carbohydrates and 1 gram of fat. The combination of the two whey sources gives you the benefits of both without making the cost prohibitive. This product does not have any fiber in it, so you will have to get that elsewhere in your diet. Additionally, if you need a carbohydrate boost for athletic performance, you are going to be a bit disappointed in this product. You are using this product primarily for weight loss and have no lactose sensitivity issues. It will not give you an energy boost or be effective for resting metabolic boosting. 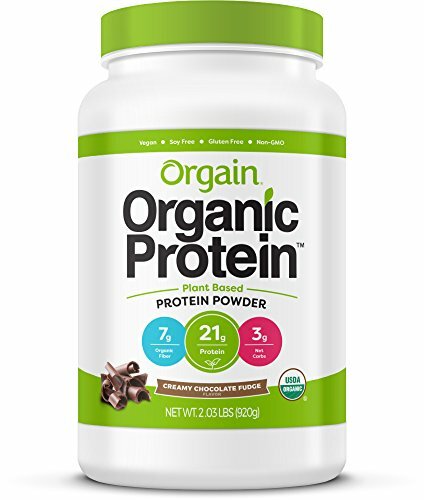 Those who follow a vegan lifestyle or who have lactose sensitivity or intolerance issues will find Orgain’s Organic Plant Based Protein Powder to be an excellent option to consider. This plant based protein powder does not contain soy, GMOs or gluten. It is entirely organic, using a blend of pea, brown rice, chia seed and hemp proteins. You will get a bit more of an energy boost with this protein powder which includes 13 grams of carbohydrates, but you’re still getting a decent amount of protein at 21 grams, while fat is limited to only 3 grams. Iron and potassium are at decent levels as additional nutrients as is fiber at 7 grams. It is an excellent all-around vegan alternative. This product has a lot fewer flavors (only 7) and is much higher priced than the other powders on our list. The higher carb content might not be optimum for weight loss. You need a non-dairy or vegan alternative protein powder and can justify the higher cost. You might not get the most beneficial weight loss results you desire from this powder. 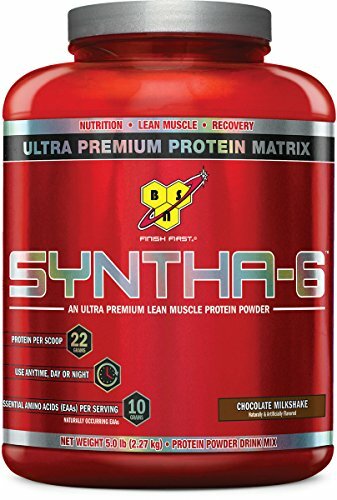 BSN Syntha-6 Whey Protein Powder is designed for muscle building and athletic performance. Its higher carbohydrate content is helpful for boosting energy for greater performance and quicker recovery. The formula of this protein powder is pure with 10 complete amino acids in each serving and does not contain additional creatine, glutamine, or vitamin complex. It contains both whey and casein protein sources. The purity of this formula, which combines both types of whey protein along with casein for a total of 22 grams, is impressive. The higher carbohydrate level, 15 grams, is good for boosting athletic performance and recovery. It also includes a good amount of dietary fiber. The fat content of this protein powder is 6 grams, which exceeds the recommended amount for a protein powder. You are using this protein powder for muscle building or athletic performance. You will not be happy with carbohydrate or fat content of this product if your objective is weight loss. 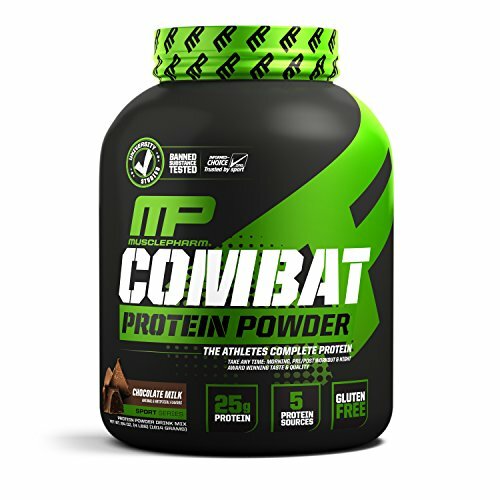 When it comes to being loaded with protein, MusclePharm Combat Protein Powder ranks at the top. Made from five different sources of protein, this powder allows you to get a boost of protein for up to 8 hours after consumption. It was specifically designed for athletic performance and quick recovery. It has award winning flavors among protein supplements and includes BCAAs, glutamine and digestive enzymes. Though this protein powder is designed for optimizing athletic performance and recovery, it is still low in carbohydrates at 5 grams and fat at 1.5 grams while it provides 25 grams of protein from various sources. The addition of casein protein in the blend allows your body to be fed by protein for up to 8 hours after consumption. 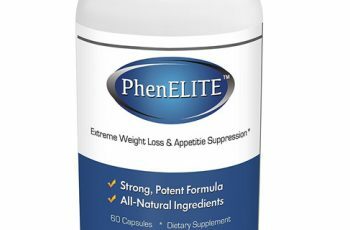 This product is very low in dietary fiber, which is overcome somewhat by the addition of dietary enzymes, and there are few additional nutrients with any significant concentration included. It does not dissolve well and can be a bit grainy and clumpy. You are building muscle or hope to lose weight. You probably won’t be satisfied with this product if you want a protein powder that blends well. 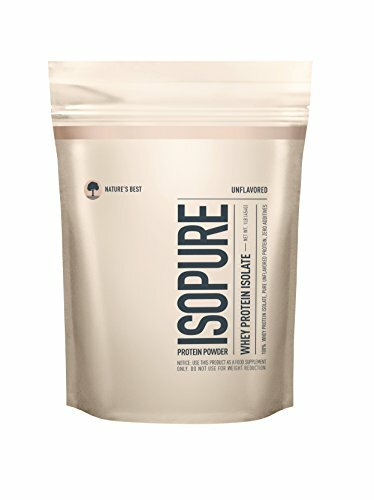 Those who subscribe to a Keto diet will be pleased that Isopure Zero Carb Protein Powder has been designed with them in mind. This supplement contains 100% whey isolate protein without any carbohydrates, any fat, gluten or lactose. It includes added vitamins and minerals and is formulated to mix well in various foods or beverages because it is unflavored. The 25 grams of protein with 0 grams of fat and carbohydrates has to grab your attention. The fact that you don’t have to consume this in a shake of some sort, but can add it into other foods and recipes is certainly a plus as well. It is both gluten and lactose free as well. This is not a vegan alternative. Flavored options of this protein powder leave a great deal to be desired. You are on a keto diet and want the added boost of a supplement that can be added into something other than a shake to be consumed. You won’t be happy with this supplement if you are vegan or need an energy boost from your protein supplement. When TGS All Natural Whey Protein Powder says that they are all natural, they aren’t kidding. The formula of this protein powder includes just two ingredients; whey concentrate and sunflower lecithin. 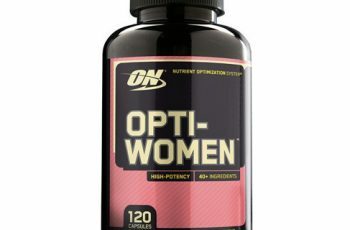 Not flavors or other additives are added to this supplement. It works well for low carb diets, post workout muscle recovery, meal replacement drinks, and general supplementation. This supplement is also GMO, soy, gluten, hormone, and rBGH free. You can’t help but be impressed by the simplicity of this product’s formula. It packs 25 grams of protein, but avoids high carbohydrates at 1.5 grams and fat at 2 grams. The absence of flavorings and additives makes it a great supplement to use in something other than a protein shake. This isn’t going to be a good supplement choice for a vegan or for those who are lactose sensitive or intolerant. In addition, with next to no carbs, it probably isn’t great for athletic performance enhancement. You are working at losing weight and desire a protein powder that can be used in more than just a protein shake. You won’t get as much benefit out of this product if you need a boost of energy from your protein powder, are lactose sensitive or a practicing vegan. 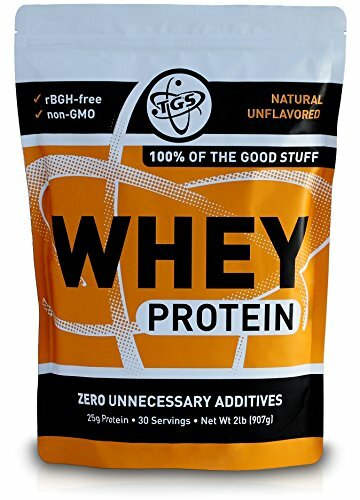 A very nice tasting protein powder. The vanilla flavour is quite natural in taste and doesn’t leave a horrible after taste like some other protein powders do. It mixes up really well and easily too. My only issue with it is the amount of power that does cling to the side of my shake bottle. This leaves me a little concerned as to how much I’ve actually consumed and how much I have missed out on. In the power itself, you’ll find that it has vitamin B6 and Branched-Chain Amino Acids. This helps with the protein synthesis and can make the difference to your gym session performances. 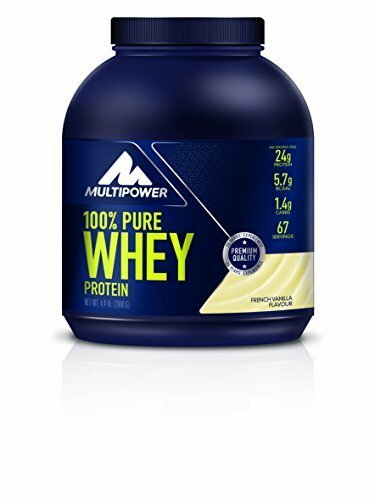 Purity is certainly a major element of Multipower’s 100% Pure Whey Protein Powder. This is 100% pure whey protein powder including concentrate, isolate and hydrolysate derivatives. It has added B6 for additional protein digestion as well as BCAAs. It will enhance muscle building and performance without a lot of additives and it maintains decent levels of carbohydrate and fat content. You get an extremely impressive 78 grams of protein in a 100 gram serving of this powder with only 4.7 grams of fat and 4.3 grams of carbohydrates. The addition of vitamin B6 to help digest that overload of protein is extremely important. Many have said that the flavor of this powder is sickeningly sweet. It is low in dietary fiber, so you need to be careful about the risk of constipation and other digestive issues. This protein powder will not work for vegans or those with lactose sensitivity. You are truly trying to build muscle and put on bulk, but you can also get along using this as a weight loss aid. You won’t be impressed with this product if you suffer from any digestive or lactose sensitivity issues. The main attraction of Naked Whey is that the whey protein used in the product comes from 100% grass fed cows. This protein powder is also non-GMO and non-denatured to make it a pure protein formula without gluten or soy. This formula also doesn’t use preservatives, artificial sweeteners or flavorings. Naked Whey is also tested free of arsenic, cadmium, lead and mercury. In essence, you’re getting whey protein without all the junk. Naked Whey has gone out of its way to produce a formula with 25 grams of protein, only 2 grams of fat and 3 grams of carbohydrates that completely hormone and GMO free. Because it is unflavored, it can also be used as an additive in all foods and not just in a shake. You can use this formula without any guilt unless you are vegan. This product is not a good option for vegans or those who have lactose sensitivity. You won’t get much of an energy boost for athletic performance from this powder due to its low carbohydrate level. It is also pretty pricey. You are looking for a pure protein powder without any of the guilt. If you are vegan or have issues with lactose, you need to look at a different supplement. Legion Whey+ Chocolate Whey Isolate Protein Powder – Made by Grass Fed Cows – Great For Weight Loss & Bodybuilding, 30 Servings. This protein powder ticks a lot of boxes. Its low carb, Non-GMO, low in calories, lactose free, gluten free and wait for it….. sugar free. It’s an ideal protein powder for those wanting to lose weight or are hard into their bodybuilding. It serves 30 portions and is really easy to mix. Those who are looking for a lactose free whey protein supplement that is produced hormone free will be impressed with Legion Whey. The formula of this protein powder makes use of 100% lactose free whey isolate as its base. Because it is produced by grass fed cows, the likelihood of encountering GMOs and hormones in this formula is greatly reduced. It is sweetened with stevia and comes in three different flavors. There is no fat and 3 grams of carbohydrates in this 22 grams of protein formula making it an excellent supplement for weight loss. Because it is lactose free, it allows those with lactose sensitivity of lactose intolerance to take advantage of faster acting whey protein. Safeguarding against hormone and GMOs is certainly a plus and this formula even comes with a 100% satisfaction guarantee. Vegans will not be able to use this as a protein powder alternative. There is only a trace of dietary fiber in this formula, so you will need to be sure to include fiber in your diet to avoid issues with constipation and other digestive issues. You are working on losing weight with a protein powder supplement and have lactose sensitivity and intolerance issues. You will want to pass this one by if you are a practicing vegan. 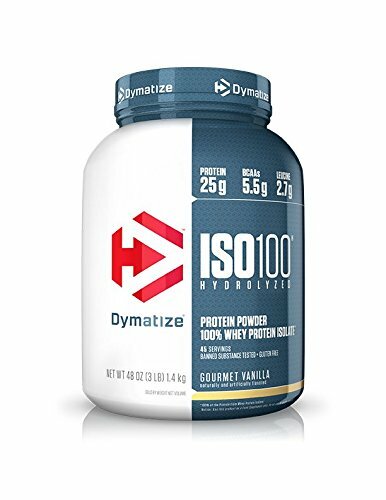 The existence of the more highly potent hydrolyzed whey protein isolate in Dymatize ISO 100 is a major selling point of this protein powder. Hydrolyzed whey isolates are faster acting and tend to be lactose free. Each serving contains less than a gram of fat and sugar and only a single gram of carbohydrates. This is a good protein powder for weight loss with 25 grams of protein but very little fat or carbohydrates to be concerned with. Being gluten and lactose free have a lot of added health benefits to them as well, especially those who are sensitive or intolerant of either one. The 5.5 grams of BCAAs is also a great benefit for getting a longer lasting effect from this fast acting supplement. Again, this product is not a good choice for vegans. In addition, this isn’t your best option for enhancing athletic performance given its negligible carbohydrate content. There is also no fiber in this supplement. Your objective is weight loss rather than boosting athletic performance and need a gluten and lactose free formula. You will not be satisfied with this product if you are vegan or looking for an energy boost from your protein supplement. You can use this anytime really, but probably best as a morning shake, mid training or after training. Using it after workouts is really beneficial as it absorbs very quickly and replenishes muscles with its high quality Isolate protein. Some people will use it throughout the day and even make meals with it. Its very versatile. Total of 43 servings – You get 3lbs of Dymatize ISO 100 Gourmet Vanilla Protein Powder in the bag. 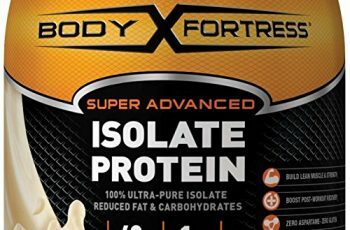 100% Whey protein isolate – Scientifically proven recipe. Digests quickly and hydrolyzed.